- F = Food, W = Wood, G = Gold, S = Stone, LOS = Line of sight, HP = hitpoints. 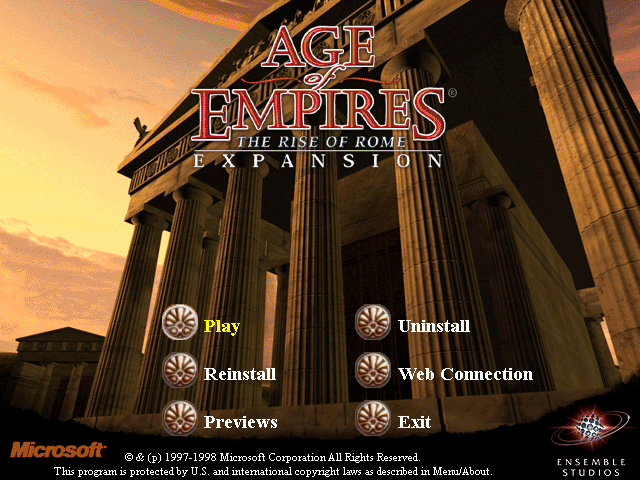 - All changes and fixes from Rise of Rome version 1.0a (update 1.0c) are also included. Check the 1.0c Readme for more details. - The list below includes the most important improvements, bug fixes and changes. - For more general information or help – click on Help above. - Support for HD resolutions - up to 2560x1440! For more detailed information click here. - HD interface graphics - interface background screens reworked and enhanced to HD quality! No more upscaled low resolution/low quality graphics. - The original CD audio soundtrack in mp3, replacing the synthesizer (midi) version. Enhanced to sound best on all configurations – headphones, stereo speakers and multichannel speakers. - 2 new random map types! The desolate "Oasis" and the treacherous "Rivers". - New gameplay options: Random Teams, Random Map Type, Post-Iron Age and more (listed below). - New HD Launcher - a remake of the original game launcher (do you remember it? ), now a central place for all UPatch HD settings and the Mod Manager. - New Mod Manager with new modding system – allows you to apply mods without replacing any original files (the proper way to handle mods, as in all modern games). With extended mod capabilities, like the ability to add civilizations. More information here. - New UPatch HD settings – please read the full information here. - Windowed Mode: allows you to play the game in a window, instead of full screen. - Player Name: allows you to change your player name in the game, including in Single Player. - Game Language: allows you to easily change your game language without reinstalling the game or the patch. - File Check: new option to check your game installation for problems – explained here. Always run this check before reporting problems. - New Scenario Editor options, which enable more control over unit placement and the use of hidden objects - more information here. - New Mouse control (now enabled by default) - previously the game did not detect right-clicks properly when moving the mouse rapidly, which prevented commands to be quickly issued one after another. - The original AOE and ROR trial campaigns (Reign of the Hittites, First Punic War) and scenarios (Multiplayer Rumble, Multiplayer Mediterranean) are now installed with UPatch HD. They were created by Ensemble Studios and should be part of the game. - Compatibility with Windows 7, Windows 8/8.1 and Windows 10. - All parts of the patch work properly with High DPI settings. - Support for 9 game languages: English, German, French, Spanish, Portuguese, Italian, Polish, Russian and Chinese (both Traditional and Simplified). - In the original game many of the civilization bonuses and technologies have wrong descriptions - with completely different values in reality than those described in help files/manual/in-game text. Most AOE players never knew that these values are not true. Such bugs and inconsistencies (now fixed) have been plaguing the game since its release, not fixed by any of the official patches. - Another big problem in the game were the extreme values in civilization bonuses. They created huge imbalances and were very unrealistic. Few of those (Shang villager cost, Phoenician woodcutting, Assyrian/Yamato villager speed, etc.) have been addressed by the Rise of Rome Expansion and the last official patch (1.0c), but many others remained until now (fixed in UPatch HD). - Save game crashes are fixed. - Distorted in-game colors (color bugs) are fixed. - Fixes to prevent crash to Desktop and inability to start the game. - Fixed the problem with wrong game fonts, causing incorrectly displayed text in-game. - Option to select random teams ("?" for team number). Two teams will be formed if everyone selects "?". - Option to select "Random" in Map Type, so that you don't know which map will be chosen. - Multiplayer population limit option extended to 400. - Post-Iron Age option added as starting age in both Single and Multiplayer. - New Path Finding option "Very High" added, set by default. - New Idle Military Units hotkey (in addition to the Idle Villager key) - press "," (comma) key to cycle through your idle military units (all units that have an attack and are not currently moving or in combat, this includes war ships). - New hotkeys to select and go to (previously these were missing): Granary (Ctrl + G), Storage Pit (Ctrl + S), Market (Ctrl + M), Government Center (Ctrl + C), Wonder (Ctrl + O). - The number of possible unit groups is doubled - numpad keys 0-9 (those on the right) can now be used to create and select unit groups, in addition to the main 0-9 keys. - New hotkeys to open the Diplomacy menu dialog ("F9"), Multiplayer Chat dialog ("F8" - only in Multiplayer) and Scenario Editor Menu ("F10"). - The game now remembers the last state (shown or hidden) of scores (F4) and timer (F11). For example if you enable scores and then exit the game, next time you play, the scores will be enabled automatically on game start. - The game now saves screenshots (CTRL+F12) in a new folder /screenshots. - All ai related files (.ai./.per/.cty) now reside in the new dedicated /ai folder. - New Starting Resource option added - "Low": 0 Food, 200 Wood, 0 Stone, 0 Gold. Appropriate for Nomad start. - "High" starting resource option changed 500 Gold, 500 Stone (previously 0 Gold, 750 Stone; Food and Wood unchanged). - Some additional checks added to the game to ensure everything works correctly; this will also prevent some types of cheats. - Multiplayer games can better detect version mismatch (this will prevent some possible out of sync errors). - Prey animals and Berry Bushes are now visible on the mini map in light green color. - Improved red and orange player colors in the game (including on mini map) - now more distinguishable. - Mini map colors are improved: player colors are more distinguishable from terrain and other player colors. - Over half of the computer player build plans (ai) were bugged and are now fixed. Many of these bugs were critical and prevented proper computer player development. - Computer players no longer change their diplomacy on accidental hits by allies (catapults, elephants, etc). - Computer players no longer automatically ally with other computer players when they are set to no team ("-"). - Added bonus computer player resources for "Hard" difficulty (+500). Makes computer players a little closer to human development speed and is the recommended difficulty. - Bonus computer player resources for "Hardest" difficulty to 1500 (previously 2000). - Fixed technology tree bugs when starting in later ages (for example Minoan Composite bowmen no longer lose their range bonus). - Ballista/Helepolis no longer receive their Alchemy bonus twice (so it's now +1, not +2). - All chariots have double attack vs. Priest. - Dock ship build times and research times fixed (they were quite messed up in the original game). - War Elephant: fixed missing attack bonus vs. buildings. - Fixed the extremely large trample damage area of War/Armored Elephant and Scythe Chariot. Their damage area is now reduced to medium-large. Comment: Previously enemy units were taking damage from 2 tiles away or on the other side of a wall. - Siegecraft: Bonus attack of villagers against walls and towers is now reduced. Comment: Previously they were stronger vs walls/towers than fully upgraded Centurions. - Fishermen gathering rate fixed (was much faster than any other gathering). - Food in fish is proportional to size (Shore fish has less food, Whales have more). - Fixed a lot of graphic and sound bugs in the game, including missing/incorrect sounds, misaligned graphics, selection radiuses, hitpoint bars, etc. - Improved the distribution of randomly generated terrain objects. - Number of maximum recommended players in map size name – example: "Large (4 Players)"
- Improved in-game text messages/descriptions and the position of some interface elements. - Full game version is now also displayed on main menu (at the bottom). - Hundreds of other small bug fixes and improvements. - New random map type - “Rivers”: Similar to Highlands with rivers, but much better. Rivers are twice wider and have more fish. Computer players will properly recognize the map type and can build Docks and ships if they want (unlike Highland). Rivers may or may not separate all players. - New random map type - “Oasis”: An all desert map with most of the wood concentrated in several oases. This map is very open, with less wood and few berries, but much more Gold, so expect some fierce battles. - Improved resource distances and quantity for each map accordingly. - More gold and stone on maps. - More fish on all water maps. - Small Islands now more playable - slightly larger islands, more forests, better resource allocation. - Terrain changes: Highland no longer has rivers (use the new Rivers map instead, it's much better); Narrows always has rivers (otherwise too similar to Continental), Continental no longer have rivers (too little space for player lands). - As you know, balance in the original game is quite bad (especially if compared to AOE2 for example) - several civilizations and units are overused, while others are practically unused. The Rise of Rome Expansion improved some aspects, but not enough. UPatch HD tries to address the remaining problems in a subtle way that preserves the original gameplay. This is what a major official patch would have done, if such was ever released. Most base unit stats (attack, armor, HP, price, etc) are the same, units available for different civilizations are also unaltered (except for Hittites). And most importantly - balance was adjusted according to user feedback and votes from surveys gathered for 2 years. - Farm upgrades give you +75/+100/+125 Food (instead of +75/+75/+75). - Hunters work 15% faster than before. Comment: previously they were as slow as Foragers, which made them far less useful. - Gold and stone miners work 15% faster (to compensate bug fixes to technologies). - Jihad: villager carry capacity penalty reduced and now more consistent for different villager types; villager speed bonus to +10%. - Short Sword directly available in Bronze Age without any researches; Broad swordsmen have +10 HP, Long Swordsmen have +20 HP. - Heavy Cavalry +1 armor. - Cataphract now stronger (+20 HP, +1 armor/pierce armor, +1 attack vs infantry); upgrade cost reduced. Comment: Cataphracts were previously too expensive and weak when compared to other super units. - Elephant Archers cost 180F, 45G (previously 180F, 60G). - Slingers have higher bonus attack vs mounted archers (bonus vs foot archers unchanged). - Camels have bonus against all mounted units (missing bonus vs elephants added). - Changes in attack reload speed (fire rate) of units: Chariot Archers: 7% slower; towers (except Ballista Tower): 7% faster (= same fire rate as foot archers). - Changes in train/build time of units: swordsmen (including Legion): 8% faster; all archers (except the Bowman) and all elephant units: 10% slower; Camels 6% slower (were too fast to train compared to Cavalry); Farms: 20% faster; towers: 10% faster. - Catapult Triremes and Juggernaughts move 10% faster (previously they were too slow). Catapult Triremes have 135 HP. - Juggernaughts can no longer destroy trees (especially problematic on island maps). Upgrade cost reduced. - Siege weapon projectiles (stones and bolts) are more realistic - travel faster (they were very slow), but are also slightly slower to reload to compensate that. - Improved damage area of Catapult (unit), Heavy Catapult and Juggernaught - reduced to 2x that of Stone Thrower (previously it was 3x - huge and unrealistic). This also means less of your own units killed by friendly fire, especially when attacking buildings. Comment: Previously these units had larger damage area than that of AOE2 catapults, which fire multiple stones in large area. - Helepolis has slower fire rate, but also +10 attack to compensate that. Comment: Helepolis (a siege weapon) had the same fire rate as archers (and twice faster than Ballista), which was unrealistic and looked ridiculous. - The previously hidden hero unit "Hero12", now renamed to "Hero" and unhidden. Unit class is fixed; some stats are increased. ----- Updated technology trees for all civilizations are available ﻿here﻿ (please do not mirror, use a link to this page instead). - Assyrians: Get Engineering and Chain Mail armor. - Babylonians: Towers have +75% HP, walls have +50% HP; get Metallurgy. - Egyptians: Priest range to +2 (previously +3). - Greeks: New bonus: Academy units cost 20% less; Ships are 25% faster (previously only warships were 17% faster). - Hittites: catapults have +40% hitpoints; War ships (except Fire Galley) +1 range in Tool Age, +2 in Bronze Age, +3 in Iron Age (+3 total); Centurion, Architecture, Irrigation and Coinage removed. Comment: Hittites were ridiculously overpowered: best Catapults in the game, best Heavy Horse Archers and Elephant Archers + fully upgraded: Armored Elephants, Scythe Chariots, Centurions and Ballista Tower + all Market, Government Center, Storage Pit and Granary upgrades. No other civilization was even remotely close to that. - Minoan: the small farming bonus (+60 Food) was removed; Ship cost to -20% (previously -30%). - Palmyrans: Start the game with +100 Food (because their villagers cost 75 F); Villagers work 25% faster for all tasks. - Persians: Elephants move 40% faster; Get Wheel, Artisanship and Coinage. Comment: Having no Market technologies in both Bronze and Iron Age was a huge and illogical penalty for the Persians. - Shang: Get Ballistics; Walls have +50% HP. - Sumerians: Get Craftsmanship; Farms have +125 Food. - Yamato: ships have +20% HP (previously +30%).